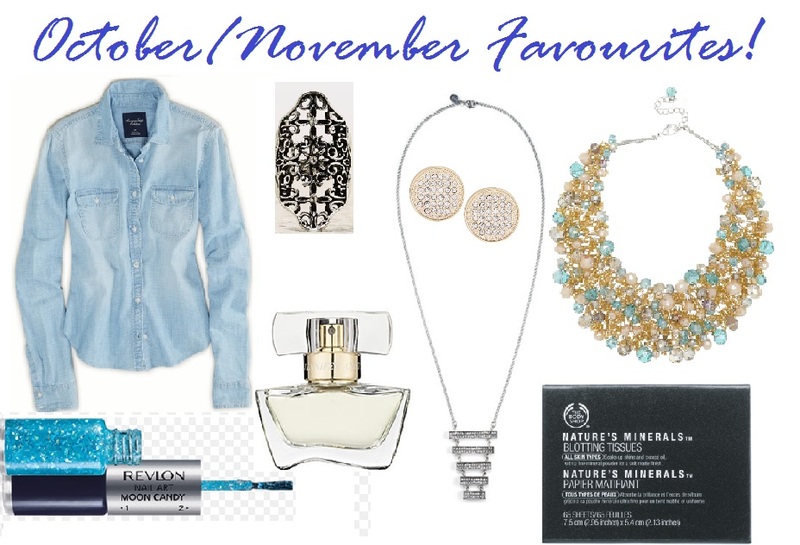 October/November Fashion and Beauty Favourites! This shirt is soft, durable, and extremely comfortable, which means you’ll want to (and can) wear it every day. A wardrobe staple, it can be worn endless ways: wear it open over your favourite tee or tank, tie it and wear it as a shrug over your favourite Summer dress to help transition it to Fall, layer it underneath a cozy sweater, or simply wear it buttoned up with a great statement necklace on top (my personal fave). My favourite thing about this top? The neutral coloured buttons allow you to wear any colour jewellery you’d like (no need to match the gold or silver toned hardware on this beauty!). I have been a fan of the Mark brand for quite some time. 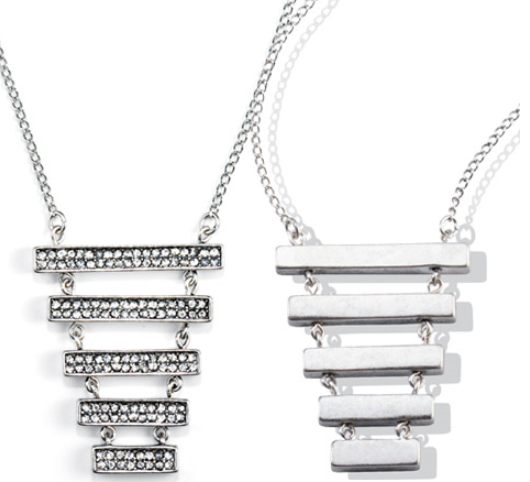 What I love about this necklace is that it’s reversible: one side has sparkle, the other is a matte-silver tone. You also have the option to adjust the length (24.5-33 inches). It’s easy to match, unique, and great quality. Feeling adventurous? Try layering it with shorter necklaces for extra pizazz! This is one of my favourite celebrity-inspired perfumes, which I purchased when it was first released, but recently rediscovered. This perfume has notes of jasmine, violet, rose water, amber, sandalwood, musk, and more. Floral enough for the Summer, but musky enough for the Fall, you can reach for this scent all year round. Cool fact? A fan of Summer days at the beach, Jennifer Aniston even designed the bottle to look like a cresting wave. As someone who struggles with oily skin on a day-to-day basis, these blotting sheets are heaven-sent. A true multi-tasker, this product removes oil from the face, while also distributing a small amount of mattifying mineral powder. Fool proof as it’s made for all skin types, and wallet friendly at just $5.00 for 65 sheets, grab a pack for the car, your purse, your desk…you get the idea! This ring has been my go-to since I purchased it last month. It is big and bold enough to make a statement, yet light and thin enough to be extremely comfortable. With pretty, intricate detailing, including 3 rhinestones for shine, this ring looks great paired with your favourite dark nail polish. Sparkly yet elegant and simple, these extremely affordable earrings go with nearly everything. Pair them with a pretty up-do to show them off, or your leave your hair down for some unexpected sparkle when you “happen” to flip your hair. Not a fan of the gold tone? They also come in silver, here. This is by far, one of the coolest drugstore nail polishes I have found in a long time. The double ended stick provides both a glossy base coat, and a sparkly, opalescent top coat. The base coat was so thick and pigmented, I only need 1 coat prior to applying the top coat. The effect that these polishes give is really unique, and is far from the simple glitter top coats you find in nearly every brand’s lineup. Check out the Revlon website for all the fun and unique ways you can wear this polish. The only downside is that it is a little difficult and messy to remove. The upside? It lasts a really long time, and the compliments will be well worth it! For me, this necklace was love at first sight (and it was on sale…don’t you just love when the stars align?). Pair it with a simple crew neck t-shirt or sweater and you’ll go from a lazy Sunday afternoon, to a Friday night on the town. Not only does it shine beautifully, it’s also extremely durable and has substantial weight to it. It also comes in other colours, depending on the season. Keep an eye out for them on the Aldo website, here. Proof that these really are some of my favourite things this month? You can find me wearing the shirt, ring, and necklace from this list in the picture from my previous post, here!